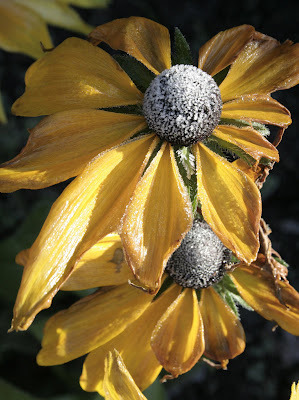 I love the look of frost on flowers – on any kind of vegetation actually. These are the last flowers in our garden. The last bit of colour, except for the hollyberries on the holly tree. Winter is really here. It’s cold and there’s talk of snow in the forecast. Although most photographers would frown on photographing such poor, half-dead specimens I find a kind of truth there that we shouldn’t overlook. Why are people so afraid of focusing on the dying? There’s a beauty there. It gives expression to something all of us go through. And if a picture like this expresses something real, something we go through occasionally, then it’s just as important to photograph as perfection. I believe in the candid, the authentic, truth. I want real. If you read my comments on my last post, you will already know that the conference was a wonderful success for me. I met many people, made many good connections, even doing a radio interview with a university radio broadcaster. This was definitely a good place for me – and for Living Room – to be. I said to my pastor today, “I guess I had nothing to worry about, eh?” But on thinking about that, I wonder if I would have prayed as earnestly as I did if I hadn’t been worried about it. The worrying helped me to prepare in every way I could. I thank God for being with me, for giving me the confidence I had prayed for. I thank him for the oodles of support I received. The oodles of prayer.